A weird thing happened when I opened this package. The little balls of dry couscous started climbing up the sides of the round plastic black bowl like bugs trying to escape from a trap. 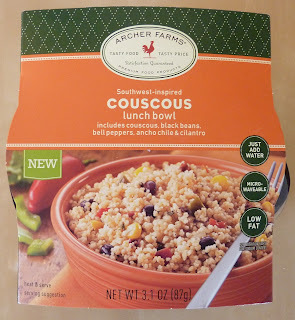 Fortunately, I didn't panic, and I realized that it was actually the static electricity I had generated while unwrapping and opening the packaging that was causing the couscous to move on its own. It weirded me out a bit, but I pressed on and continued preparing this couscous dish. It's been a while since I've had couscous. I thought I remembered liking it, but after this meal, I'm not really so sure. It wasn't terrible by any means, but really liking couscous is definitely a prerequisite for enjoying this bowl. I added the recommended amount of water and stirred it for quite while before popping it in the microwave. I thought that it might actually need more water, since some would undoubtedly evaporate while heating, but when it was done, there was an excess of water instead, though some more of it did get absorbed while "fluffing" the couscous with my fork, as recommended on the preparation instructions. Despite copious stirring and fluffing, the powder flavoring wasn't distributed evenly. It seemed to settle at the bottom, making the top layers too bland and the bottom layers too strong. The flavoring had a nice southwestern kick to it, and it was flavorful as well—like a good southwestern style salad dressing almost. Mmmm...salad dressing from an OXO Salad Dressing Shaker, Black (Google Affiliate Ad)! The couscous itself felt and tasted instant, which of course, it is, but you never want instant stuff to taste that way. I had forgotten how gritty and unusual the texture of couscous is, and I think the quick microwave preparation might enhance those potentially-negative properties of the couscous. As I said before, you really have to love couscous to make this purchase worth it. Our bowl was on special for $2.19. And considering that it's relatively healthy, save for a hefty dosage of daily sodium, it wouldn't be a terrible lunch if you happened to be a fan of the taste and texture. Unfortunately, I wasn't. Also, the last little bit of couscous is nearly impossible to get out of the bowl with a fork, as there are frustrating little grooves for them to hide in on the sides of the container. All things considered, I don't see myself making this purchase again any time soon. I give this 5 out of 10 stars. Actually the couscous sounds interesting enough to try. How do they get such high protein/fat ratios from mostly-wheat couscous? Protein-enhanced (GM) wheat? I enjoyed their 51c11p1f CajunRice&Beans, but assumed the 11g of protein came from the beans.